The red clay, or terre battue as it’s called in France, is basically a 10-week (women) or nine-week (men) season every spring when the best players in the world get to play on arguably the best surface for tennis. Unlike hard courts, clay it is forgiving and allows for natural sliding as players move into the ball. And unlike grass, which is also easier on the body, it doesn’t get chewed up and can be restored to a pristine state with a swift sweeping and watering. With the men’s clay-court season beginning in earnest with the Masters 1000 in Monte Carlo next week and the women’s WTA Premier event in Stuttgart in two weeks, it appears Canadians will mainly be focused on teenaged prodigies Denis Shapovalov, who turns 20 next Monday, and 18-year-olds Bianca Andreescu and Félix Auger-Aliassime. Genie Bouchard is stepping away from tennis for a while to try to get fit and healthy and is unlikely to play again until the French Open at the earliest. Milos Raonic is not entered in Monte Carlo or any other tournaments until Madrid in early May after losing in the third round of the Miami Open to Kyle Edmund while suffering from a back issue. So his return for the clay-court season is in doubt. He skipped the French Open a year ago. And Vasek Pospisil, recovering from back surgery in January, is probably not returning until grass-court events post-Roland Garros when he will be able to use a protected ranking for entry to tournaments after being off the tour for more than six months. 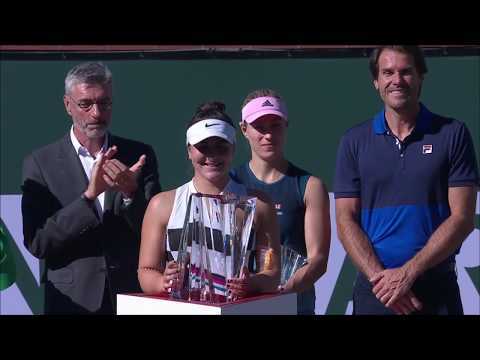 After her phenomenal success in winning the BNP Paribas Open in Indian Wells, Andreescu will probably be the most fascinating of the young Canadians to follow on the European red clay. She begins her spring season with the Canadian Fed Cup team when it faces the Czech Republic on an indoor clay court in Prostejov in a World Group Playoff the weekend of April 20-21. Her tournament schedule after that is uncertain until the WTA Premier events in Madrid and Rome beginning on May 5th. Andreescu has only played two matches on clay this year – indoors in ’s-Hertogenbosch, the Netherlands, in February in Fed Cup action. She was dominant in both – defeating No. 150 Richel Hogenkamp 6-4, 6-1 and No. 129 Arantxa Rus 6-4, 6-2 at a time when she was ranked No. 70. Over her young career Andreescu has only played seven events on clay and has a 13-5 record. But everything about her game suggests she will be able to perform well on the surface – probably first and foremost because she is an excellent mover. Andreescu has roughly 100 of her 2003 points to defend over the clay-court season, giving her an opportunity to improve on her current No. 23 ranking. For a guy who’s in his fourth year playing in the pros, Shapovalov doesn’t have that much experience on clay – having just played an overall total of 45 matches at the ATP Tour, Challenger and Futures levels with a 29-16 record. Auger-Aliassime, by comparison, has played 104 matches on clay. A year ago Shapovalov started slowly on the red dirt, losing in the first round in Monte Carlo (Tsitsipas) and Budapest (Basilashvili) before reaching the semi-finals in Madrid, the round-of-16 in Rome and the second round at Roland Garros. This year he has 495 of his total of 1,820 points to defend during the European clay-court season. He begins next week in Monte Carlo and then is slated to play Barcelona, Madrid and Rome heading into the French Open. A year ago he gained valuable experience on the clay as the season progressed and it took No. 3-ranked Alexander Zverev (Madrid) and No. 2 Rafael Nadal (Rome) to stop him in the two Masters 1000s events. At Roland Garros he had a disappointing 5-7, 7-6(4) 7-5, 6-4 loss to No. 70-ranked Maximilian Marterer, a rangy, German lefthander who actually played well. Turning 20 next Monday when he’s in Monte Carlo, the left-handed Shapovalov has the heavy topspin forehand and kicker serve to have his aggressive game translate well onto the terre battue. Although he’s 16 months younger than Shapovalov, Auger-Aliassime, as mentioned above, has played more than twice as many – 104 to 45 – matches on clay during his career. Louis Borfiga and the brain-trust at Tennis Canada in Montreal have believed that clay would be best for developing his game. A year ago he skipped the grass-court season in June and July to play clay-court tournaments in France, Italy, Germany, Sweden, Croatia and Switzerland before returning to Canada to play the Rogers Cup in Toronto. His plans for the 2019 season are to play Monte Carlo, Barcelona as well as Madrid, where he has a wild card, and Rome where he’s a direct entry (because of the six-weeks ahead lead-in entry time). He has also been given a wild card into the ATP 250 in Lyon – no surprise because he has won two of his four Challenger tour titles in France’s second largest urban area – the week before Roland Garros. Auger-Aliassime is in a favourable position in terms of rankings over the next two months. He only has 38 of his total of 1,245 points to defend right through Roland Garros – so he could make a nice ranking advance with good results. Andreescu (family from Romania), Shapovalov (family from Russia) and Auger-Aliassime (lots of experience playing “on the continent”) should all be comfortable playing in Europe for the next four months. And all three speak more than one language which should also make them feel a little more at ease far from home. The heart of the tennis season is about to start and it lasts through the US Open which ends on September 8th. Canadians will be hoping to see significant improvements in the rankings of Andreescu, Shapovalov and Auger-Aliassime by the end of the summer. Dustin Brown, the 34-year-old German, won the Challenger title in Sofia Antipolis, France, on Sunday. He missed much of 2018 with a back injury but is clearly back to his old tricks as is demonstrated in this compilation of his wild and crazy shot-making last week. Do you know your grunts? You can take the test, cleverly put together by ATP Tour staff, and play along with five ATP players – Alexander Zverev, Jeremy Chardy, Kyle Edmund, Andrey Rublev and Steve Johnson. But you have to listen very carefully!